New York City Ballet - Serenade, In the Night, Jeu de Cartes - 1/25/2003 - by Roberta E. Zlokower. - Article sponsored by Danskin. New York City Ballet - Square Dance, Robert Schumann's "DavidsbündlertÃ¾nze", Slaughter on Tenth Avenue - 1/24/2003 - by Roberta E. Zlokower. - Article sponsored by Danskin. Martha Graham Dance Company - Phaedra, Lamentation, Diversion of Angels, Chronicle - 2/1/2003 - by Roberta E. Zlokower. Martha Graham Dance Company - Embattled Garden, Deep Song, Diversion of Angels, Night Journey - 1/29/2003 - by Roberta E. Zlokower. Chicago, the movie - 1/26/2003 - by Robert Abrams. 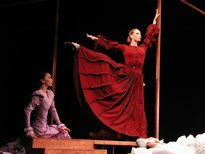 Appalachian Spring - a photo essay - 1/22/2003 - by Lisa Allen. Errand in the Maze - a photo essay - 1/21/2003 - by Natalie Laruccia. Maple Leaf Rag - a photo essay - 1/21/2003 - by Natalie Laruccia. Night Journey - a photo essay - 1/29/2003 - by Robert Abrams. Embattled Garden - a photo essay - 1/29/2003 - by Robert Abrams. Guitar Double Bill - Bucky Pizzarelli, Howard Alden, Gene Bertoncini and Pat Martino Quartet with Jim Ridl, Piano; Ari Hoenig, Drums; Steve Varner, Bass at Iridium Jazz Club - 1/25/2003 - by Roberta E. Zlokower. Emily Lester Performs at Danny's Skylight Room Cabaret - 1/16/2003 - by Roberta E. Zlokower. Martha Graham Dance Company - Phaedra, Lamentation, Diversion of Angels, Chronicle - 1/28/2003 - by Robert Abrams. Phaedra - a photo essay - 1/28/2003 - by Robert Abrams. The New Copa… Was it Worth the Wait? - 1/30/2003 - by Marcus Brooks. La Boca Candids - 1/14/2003 - by Roberta E. Zlokower. Stacey Kent - 1/13/2003 - by Roberta E. Zlokower. Bailemos Tango at Pierre Dulaine - 1/11/2003 - by Roberta E. Zlokower. Gonzalo Rubalcaba Trio - Afro-Cuban Jazz - 1/11/2003 - by Roberta E. Zlokower & Kathleen Banovich. La Belle Epoque candids - 1/10/2003 - by Roberta E. Zlokower. An interview with Nick Danielson - Assistant Concertmaster, New York City Ballet - 1/21/2003 - by Roberta E. Zlokower. - Article sponsored by Danskin. Martha Graham Dance Company - Opening Night - 1/22/2003 - by Roberta E. Zlokower. New York City Ballet - Serenade, Le Tombeau de Couperin, Pavane, Thou Swell - 1/26/2003 - by Robert Abrams. - Article sponsored by Danskin. Movimientos en Color - a collection of dance photography - 1/29/2003 - by Lisa Allen. Lisa Allen will be showing a new collection of photographs on January 29, 2003 at Empire Dance Studio (127 West 25 Street, 11th Floor). Wine and cheese reception from 8-10 pm, with a Tango/Salsa party from 9 pm to 1 am. For more information, contact Lisa at lallen21@yahoo.com. The exhibit will run through March 2, 2003. Appalachian Spring - a photo essay - 1/22/2003 - by Robert Abrams. The Dual Lives of Jeanine Durning - interview and review - 1/23/2003 - by Anne Zuerner. Manhattan Amateur Classic 2003 - commentary - 1/24/2003 - by Rachel Rabkin & Robert Abrams. Manhattan Amateur Classic 2003 - photos - 1/17/2003 - by Robert Abrams. Manhattan Amateur Classic 2003 - photos - 1/18/2003 - by Robert Abrams. Manhattan Amateur Classic 2003 - Junior MAC photos - 1/19/2003 - by Robert Abrams. ChameckiLerner's Visible Content at DTW - 1/20/2003 - by Anne Zuerner. Maple Leaf Rag - a photo essay - 1/21/2003 - by Robert Abrams. An interview with Deanna McBrearty - Corps Ballerina - New York City Ballet - 1/15/2003 - by Roberta E. Zlokower. - Article sponsored by Danskin. Martha Graham Dance Company Opening Night - 1/22/2003 - by Robert Abrams. New York City Ballet - In the Night - 1/17/2003 - by Roberta E. Zlokower. - Article sponsored by Danskin. New York City Ballet - Raymonda Variations - 1/19/2003 - by Roberta E. Zlokower. - Article sponsored by Danskin. Errand into the Maze - a photo essay - 1/21/2003 - by Robert Abrams. Happy Birthday to Ligaya Fish! - 1/15/2003 - by Robert Abrams. CARLITOS DE CHEY IS BACK FROM BUENOS AIRES!! 743 8TH AVE. BTW. 46TH AND 47TH STREETS, 2 FLOOR. The Bob Dorough Trio At Iridium Jazz Club - Sunday Jazz Brunch Buffet - 1/5/2003 - by Roberta E. Zlokower. First Night—Providence, RI - 2003 - 12/31/2002 - by Roberta E. Zlokower. Sarah La Rocca's All Night Argentine Tango Milonga at Stepping Out Studios - 1/4/2003 - by Roberta E. Zlokower. Intimacy in Black and White - a photo essay - 1/20/2003 - by Natalie Laruccia. New York City Ballet - In G Major, In the Night, and Fancy Free - 1/16/2003 - by Robert Abrams. - Article sponsored by Danskin. Hollywood Meets Broadway Winter Showcase at the Chashama Theatre presented by Dance Times Square - 1/18/2003 - by Debbie Breckenridge. New York City Ballet - Raymonda Variations, Vespro, and Symphonic Dances - 1/11/2003 - by Robert Abrams. - Article sponsored by Danskin. New York City Ballet - 1/11/2003 - by Mila Gorokhovich. - Article sponsored by Danskin. Ballroom Dancing - Part of College Life - 1/19/2003 - by Mila Gorokhovich. Ballroom and Latin - Team Match - Now with new team information and photos! The MAC 2003 will take place from Friday January 17-19 at Columbia's Lerner Auditorium (Bway and 115th street). ExploreDance.com is sponsoring the Team Match on Saturday, January 18. Don't miss the excitement! La Belle Epoque Argentine Tango Milonga - 1/3/2003 - by Roberta E. Zlokower. Wally Cardona at Danspace Project - 1/12/2003 - by Anne Zuerner. Dancers take the floor - The Zena Rommett Floor-Barre Technique - 1/13/2003 - by Rachel Rabkin. - Article sponsored by Danskin. Feathered: White and Black - a work in development presented by Valerie Norman and VanDance at the Joyce SoHo - 1/12/2003 - by Robert Abrams. Seven Films at the Dance on Camera Festival 2003 - 1/11/2003 - by Robert Abrams. New York City Ballet - George Balanchine's Symphony in Three Movements - 1/8/2003 - by Roberta E. Zlokower. - Article sponsored by Danskin. Doug Elkins Dance Company - The Look of Love - 1/4/2003 - by Robert Abrams. New York City Ballet - George Balanchine's The Nutcracker - 1/3/2003 - by Roberta E. Zlokower. - Article sponsored by Danskin. The Dancing Shoes - 1/6/2003 - by J. Salmon.